Cut out a Menorah shape (use our template for help) and 9 candles from the felt. Using fabric glue stick these shapes to your backing fabric. Cut out nine flames from yellow felt. Stick the eye of nine hook and eye fasteners just above each candle and the hooks to the flames. 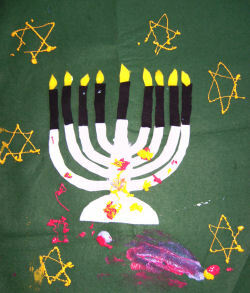 Decorate your Menorah hanging with fabric paints.